The president had previously donated a quarterly salary each to the National Park Service and the Education Department. 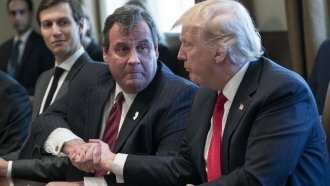 President Donald Trump has donated his third-quarter salary of $100,000 toward battling the opioid crisis. Eric Hargan, acting secretary of the Health and Human Services Department, announced the donation Thursday. "We are so pleased that President Trump has chosen to donate his salary this quarter to the planning and design of a large-scale public awareness campaign," Hargan said. During the 2016 presidential campaign, Trump said he wouldn't take the yearly presidential salary, and has been donating it instead. So far, he's also donated to the National Park Service and the Education Department. In October, Trump declared opioid addiction a "public health emergency." But so far, the administration hasn't asked for more money to fight the crisis, and the fund for public health emergencies has only about $57,000.